If you’re familiar with xylitol, you are probably familiar with it as a sugar alternative. It’s a popular choice among diabetics and others that are trying to maintain a sugar-free diet. We love xylitol as a sweetener, and have it available for the consumer in two varieties. XyloSweet is our 100% xylitol sweetener that has zero grams net carbs, can be used in a 1:1 ratio for sugar, has 40% fewer calories than sugar and comes in at a seven on the glycemic index, compared to table sugar which comes in at about seventy. 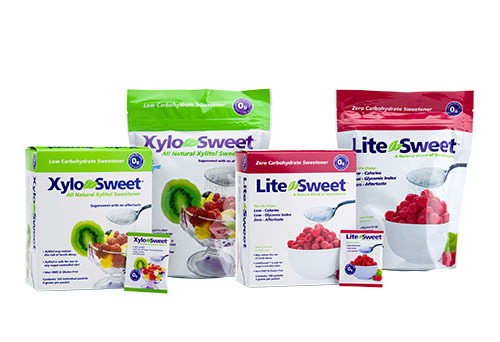 Lite&Sweet is our xylitol and erythritol sweetener. This xylitol product has zero grams net carbs, can also be used in a 1:1 ratio for sugar, has 70% fewer calories than sugar, and comes in at a three on the glycemic index. Visit our sugar-free xylitol recipes page to find amazing and creative ways to use a xylitol sweetener. Our xylitol sweeteners are available online through our store, or at retailers near you. While xylitol as a sugar alternative is commonly known, products containing xylitol come in all forms, including dental health products. There have been multiple studies, many out of the University of Turku in Finland, that show the dental benefits of xylitol products. It’s because of these dental benefits that Xlear created a full range of dental products containing xylitol under the brand name Spry. 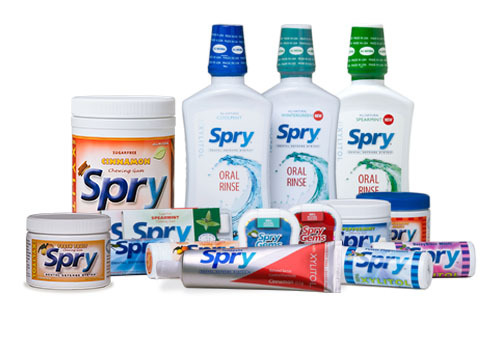 Our Spry Oral Care line consists of toothpaste, mouth rinse, floss, gum, mints, and even candy. Clinical studies show that xylitol may reduce dental caries and plaque in the mouth. The recommended dose for xylitol isn’t really a “dose”. For years professionals suggested having five to ten grams of xylitol a day, but recent studies have expanded this protocol. The recommended “dose” is actually five uses of xylitol rich products per day spread throughout the day. At Xlear, we like to say, “Strive for Five.” This is easily achievable when you break down your daily routine. Making simple changes in the products you purchase can make all the difference the next time you visit your dentist. Think about it: you brush your teeth twice a day–not to mention plus flossing and rinsing, right? If you are doing all three of these things twice a day, you’re already getting five exposures. If you throw gum, mints, or candy into this mix, you’ll definitely meet your five exposures of xylitol a day. Our Spry oral care products containing xylitol are available online or at local retailers near you, all for an affordable price. Our xylitol products don’t stop there, though; you can get your 5 exposures in more ways than just your oral healthcare routine. Did you know there are benefits to having xylitol in sinus care products? Who would have thought to add a sugar alternative to a nasal spray? The truth is, xylitol is an amazingly versatile product and its benefits seem to be endless. Sinus care products containing xylitol have been shown to effectively and naturally help clear congested airways. Our Xlear nasal spray contains only purified water, xylitol, saline, and grapefruit seed extract as a preservative. Instead of using a nasal spray that contains ingredients you can’t even pronounce, we recommend a natural alternative. The xylitol helps clear the nasal passages of debris and also creates a protective layer that helps to keep bacteria and irritants from sticking to the nasal passages. 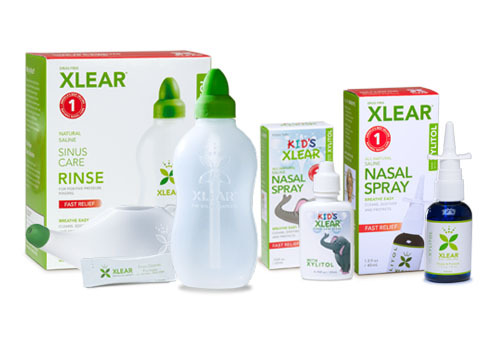 Xlear has a full line of sinus care products containing xylitol, from nasal sprays for adults and kids, to neti pots and sinus pressure rinses, and even throat relief syrups. The goal is to avoid sugar and reduce the incidence of harmful bacteria in the sensitive tissues of the mouth and sinuses. Using a sinus care product with xylitol has more benefits than just clearing your sinuses. It can also help with mouth breathing. You can find any of our Xlear sinus care products containing xylitol at our online store, or find a retailer near you and pick up your xylitol products today.